What happens when you use too light of a load in your revolver. I thought this video was pretty interesting. I guess the guy was using light .38 special loads in his 715. Light loads not the issue here. This is clearly a case of a squib load followed by a full power round. Bad scenario. I’ve seen the potential of this happening a few times in my shooting experience. The squib load is a faulty round that has a primer but no powder in the cartridge case. The primer ignition has enough power to release the bullet from the case and send it only partway down the barrel. If the shooter doesn’t notice the “light” load and fires the revolver again the next bullet is going to have excessive pressure due to the barrel obstruction. Kaboom!! Looks like the second bullet bumped the squib almost out of the barrel, but not before the excessive pressure ruptured the barrel first. There is a picture floating around of a DW barrel with SEVERAL bullets in it that had been cut in half. Squib loads can be either no powder, bad powder, wrong powder, or too light of load, etc. Looks to me like more than one full power shot followed the squib. That is certainly a squib round followed up by at least one full power round. Good lesson to always check the hatrel for obstructions after a weak shot. If a man designed it, and a man built it, then a man can fix it. I guess it didn’t say it in the video. The stuck round was followed by 5 additional rounds I believe. This video doesn’t show the rest of the revolver, just the barrel. If you google ‘blown up revolvers’ there are some very interesting photos of guns in various stages of catastrophic failure. I’m amazed that any revolver could hold together for multiple full power loads following a squib, but apparently it has been done. I got a revolver from a customer once that wanted me to check the batch of the barrel I put on his revolver. It “got open” for some reason and he wanted a rework of the job….. for free of course. The reason for fixing his revolver was a bulge caused by a .38s that got stuck and a second .38S that worked quite alright (my interpretation of what happened). I made him a really nice PPC R1500 revolver with an exchangeable barrel. He called me after the first test and said that something was wrong with the barrel. When I got the revolver back, I had a quick look and then called him and asked what ammo he had used. First few cylinders was the same .38S that he had before…. hmmm… and then some .357M, but he was unhappy because the barrel broke after “a few rounds”. I opened the barrel to examine what could have happen. I found (from the dangerous end…) 3 copper plated 158 grain bullets, one 158 grain bullet that seemed to have been jacketed and one 158 grain metal jacket bullet. my interpretaion of the case is that he first shot a cylinder of .38Special of the “not so well working” batch where the third or fourth bullet got stuck. 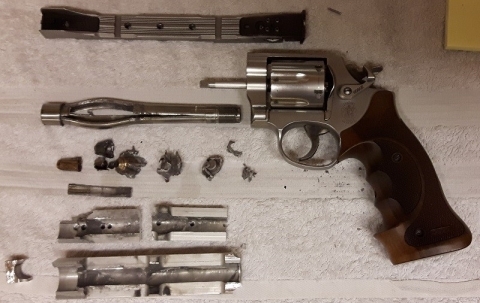 After finising that cylinder he reloaded with .357Magnum and shot one or two round before he realized that there was a problem with “leaking gases”. Funny thing is that the cylinder is unharmed. There is a pic in one of the threads of a barrel cut in half lengthwise, with all six slugs stuck in the barrel. ^^^^THAT, is really, really scary! If you're going to drink, don't drive. Don't even putt. I found the pic of the revolver I got back from a customer for “minor repair”. Wow, what a mess lucky no one got hurt. I hope you were able to rescue the bullets and reload them… at least? Cool pic…thanks for sharing it! Anyone know where I can find that photo? Interesting. Is this condition altogether avoidable by simply using quality .357 ammo? This is some scary stuff, since I’ve been blasting boxes of Winchester 158 gr 38 spcl. ammo.. There is always a possibility of having a squib load in even a quality box of ammo. It is rare, but it can happen. Much more likely in inexpensive reloads bought at a gun show for example. After seeing this happen to a friend’s 9mm 3 times out of one box, we both vowed never to buy anything but quality ammo going forward. This sort of thing would likely never happen at an IHMSA match where we have 2 minutes to shoot five targets. We’re going to notice the odd sounding round and/or the lack of reaction downrange. However, in rapid-fire shooting events things are happening too fast, and by the time our brain registers that something is wrong we’ve already pulled the trigger again. I wouldn’t be worried about using any well established brand name ammo in any shooting scenario. Your Winchesters are fine, and the chances of a squib lurking in a box would be extremely small. Blast away with confidence! My best guess on what happened in the video post above goes something like this: an inexperienced hand loader neglects to put powder in a multi-stage reloading press (or the powder wasn’t dispensing properly) not realizing that his finished product (which looks normal from the outside) has only primers to launch the seated bullets. He blasts a cylinder full down the barrel. The squib bullets simply stack up in the barrel with not enough force to burst anything until the last one hits home. I still believe if even one of those rounds had been a full power .357 the gun would have blown up much more dramatically!